Thanks. I was actually working on a movie in NOLA...so no vaca there. But just got back from 2 weeks in Palm Springs, Vegas and SF......long overdue. Anywho...thanks for the kind words. Will be posting more screens tomorrow of the work I've done this evening. I'm in the fortunate position, due to the movie I just did, that I am taking the rest of the year off. Second half of the year will be spent in Europe. All the new stuff looks great. I'm always happy to see an update from you. This is coming along really nicely. 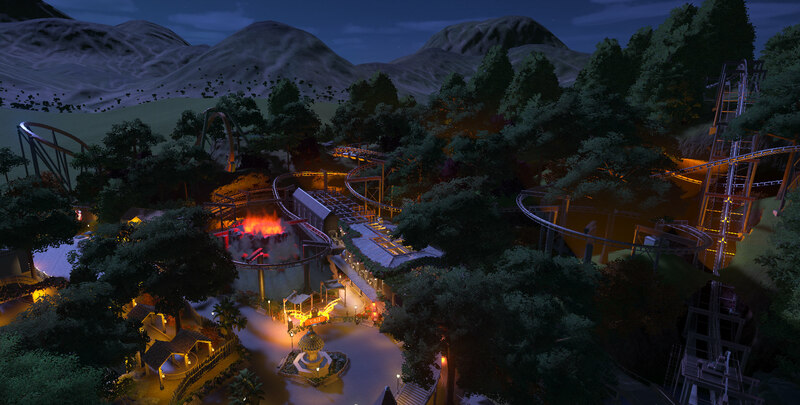 In the last few screenshots, do I see elevation changes in the paths? It's hard to tell. But extra kudos to you if there are, as I know what a pain that is to do. Thanks. And yes, many elevation changes in the paths. Howdy. 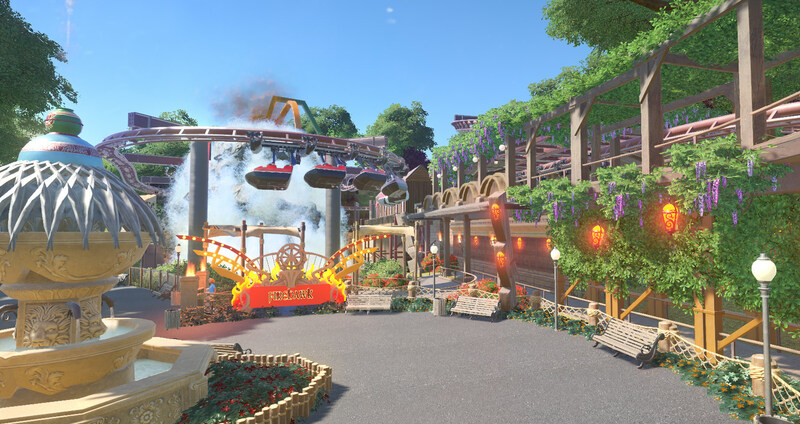 Some theming and such around the GoKarts. Enjoy! 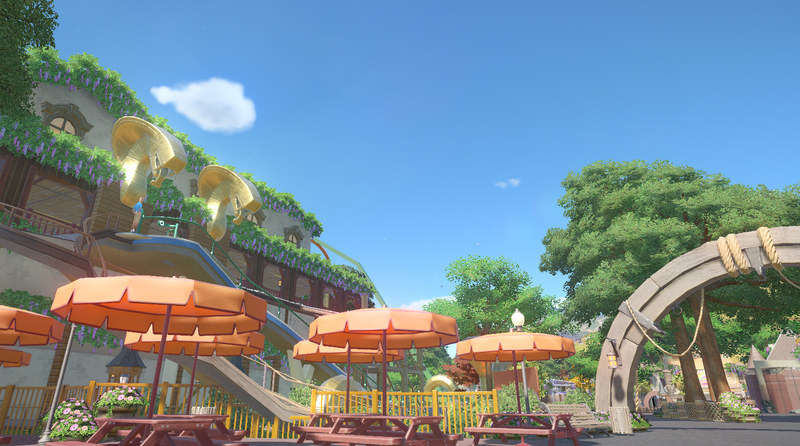 That's a very well-executed, attractively quaint style of building around the track. What do you call it? Thanks. I call it mish mosh eclectic. The atmosphere is so enchanting! 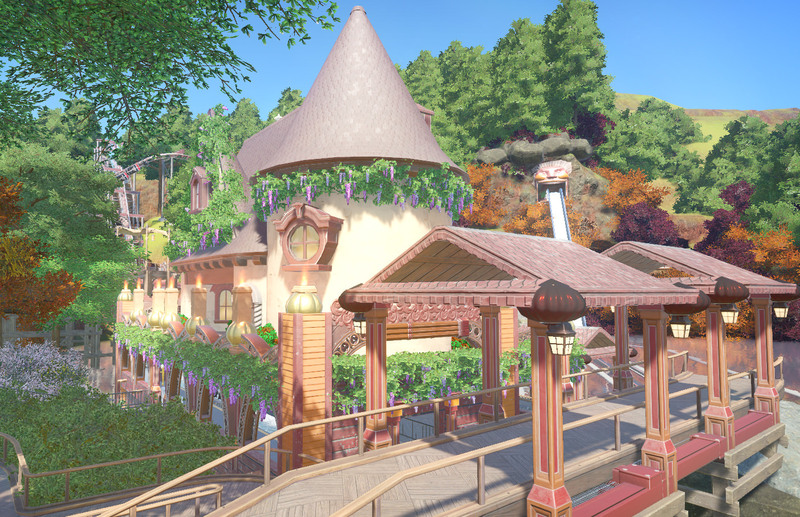 I get a little french countryside influence. Looks really nice! Your buildings are very quant. Happy Saturday! 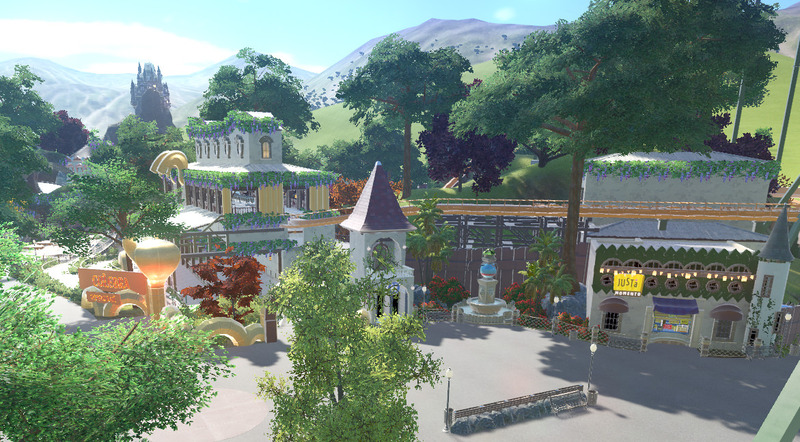 Some more progress made today on Palisade Park, including a reverse overview shot of the park. Cheers! You keep coming up with unique building styles that I keep liking . 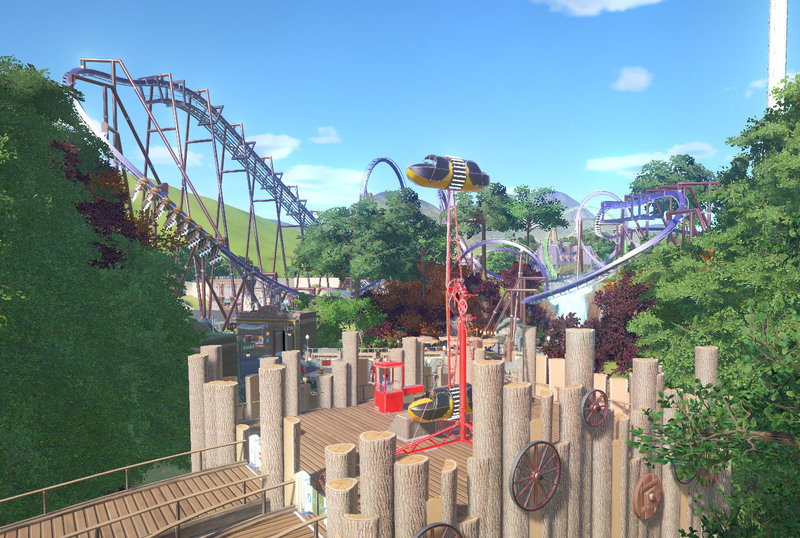 Also, those coasters look fun. 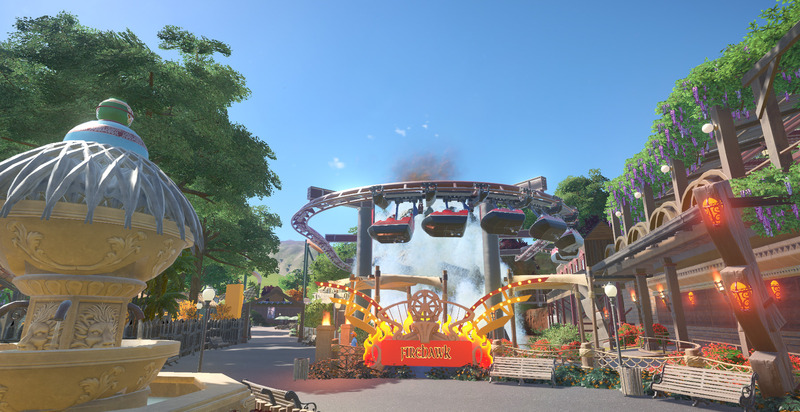 When do we get to ride? Thanks for the kind words. A few more shots to round out the weekend. 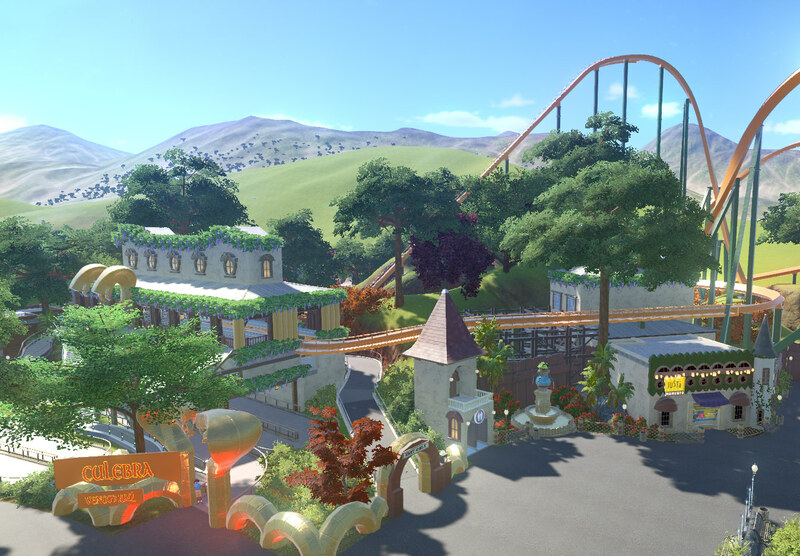 I will release the park when it's done.....hopefully before August. 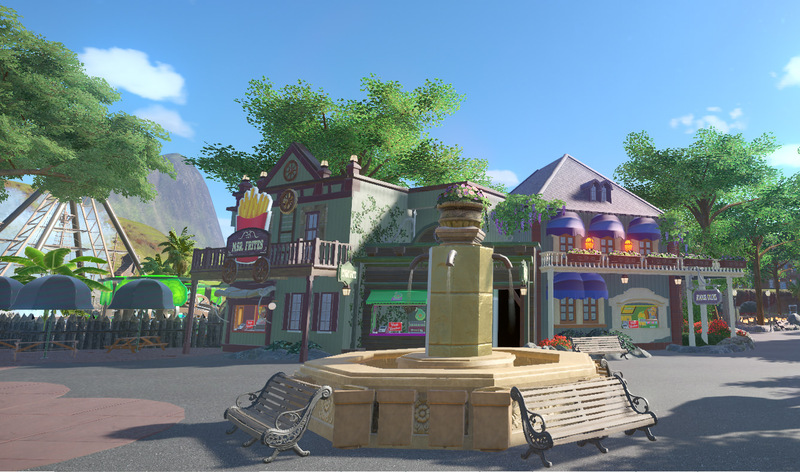 I love the organic look you've given this area, with the great landscaping and flowers growing along the edges of the buildings. You don't give yourself enough credit. I've been spending a lot of time at Quarantine Island (for reasons that will soon be disclosed. ) and there are so many brilliant things to discover in that park. Don't even think about giving up. Well, this is one of those projects that could make you go "k, I'm done" For me, it's very much inspiring. This is nitpicking on a very very high level so don't mind me, but if anything you could change the elevation of some of the bushes on the building maybe, to kinda break the repeating pattern? Thanks for the kind words. Keeps me plugging along on this behemoth. Last 5 screens of this weekends work. Not gonna play PC again until Tuesday when the update comes out so I can see what I might need to reimagine. 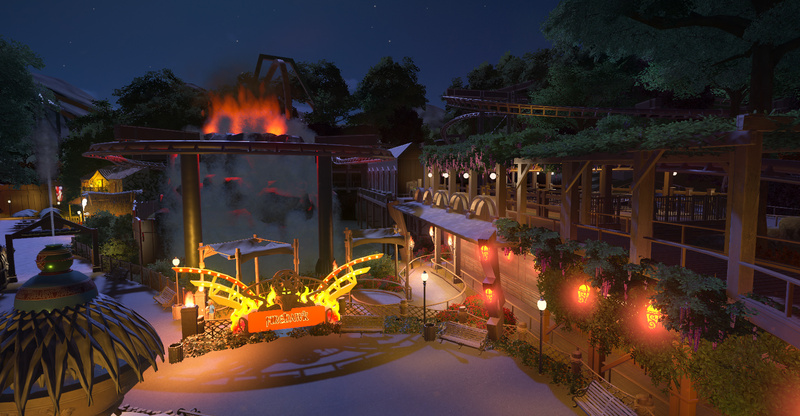 Would really like to see that last turn of Firehawk in action. Looks stunning. 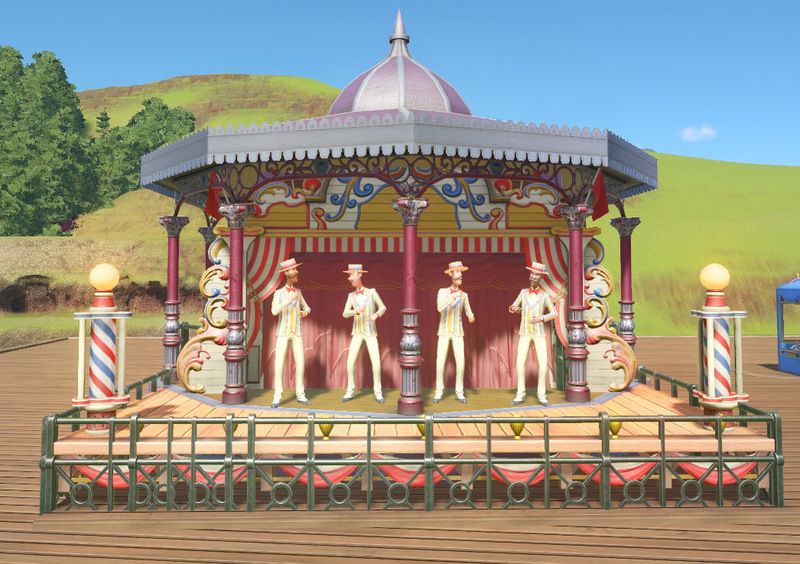 Having my personal problems with the RMC single rail's looks but otherwise, great! Thanks all. Bullethead, I don't think you give yourself enough credit for your work. It's quite fantastic. An dinoco.......I'd love to hear what specifically you aren't liking about Culebra. I always appreciate feedback on things that can be improved. Please let me know your thoughts. It can only help me improve my game. Cheers! Oh, I thought you had input for the ride itself. Yeah, having now been on one of these RMC single rails, I will say that the ones that are now out, have a much smaller rail as they are single rider cars.....but damn are they intense. Hopefully the kind of trains that are in the game will be out in real life soon as it's weird not being able to sit next to anyone. I feel like Steve Martin in "The Jerk" with these photos......."The new phone book is here! The new phone book is here!" 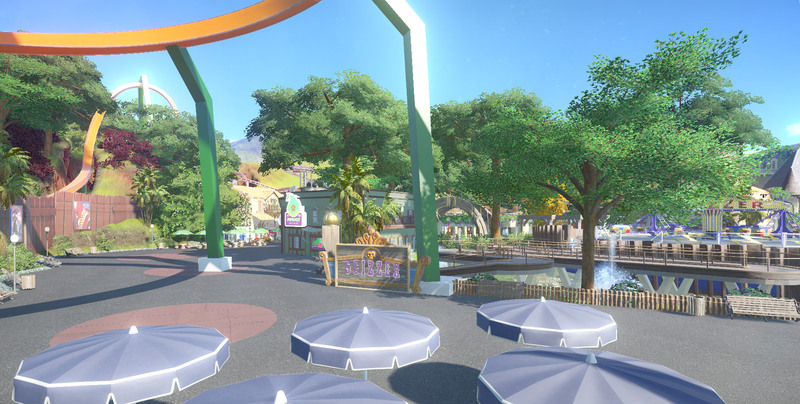 This new pack is both interesting and a challenge to integrate the pieces into my park without making it look out of place. So...here is Diablo Falls. I'm fairly pleased with the result. 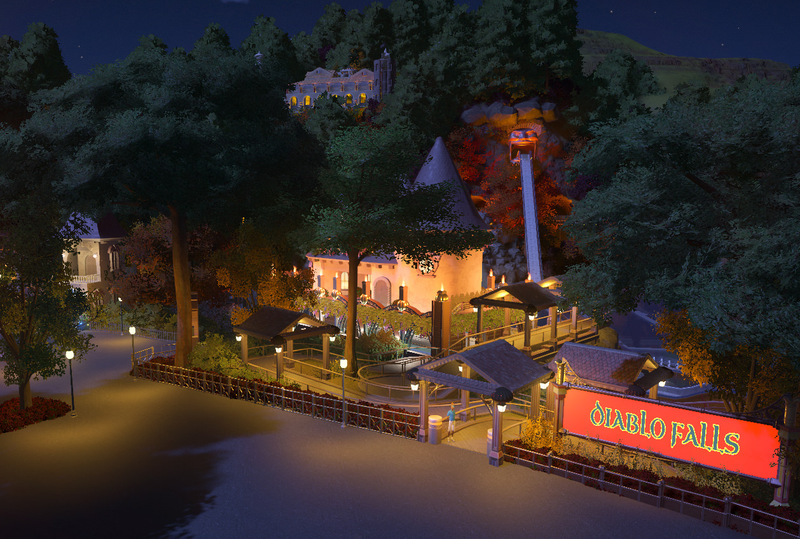 Your log flume has a nice feel to it, although I guess the "Diablo" part takes place indoors, as the outside looks very lush and well kept. 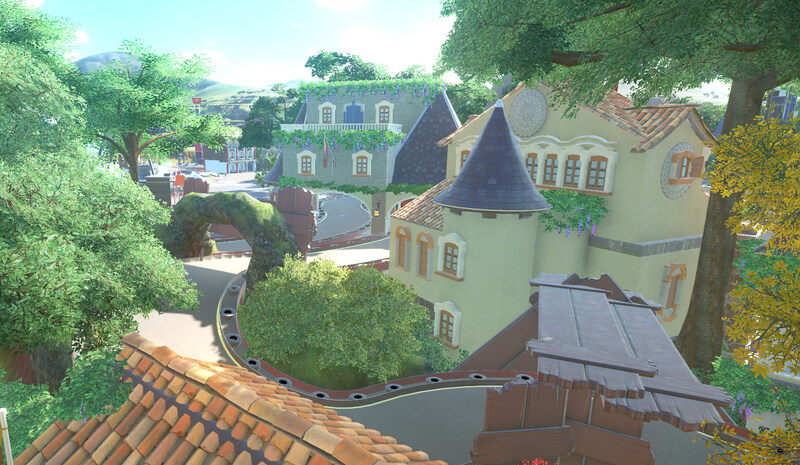 Maybe add a couple climbing twines to the buildings, green as they are? Howdy dinoco. 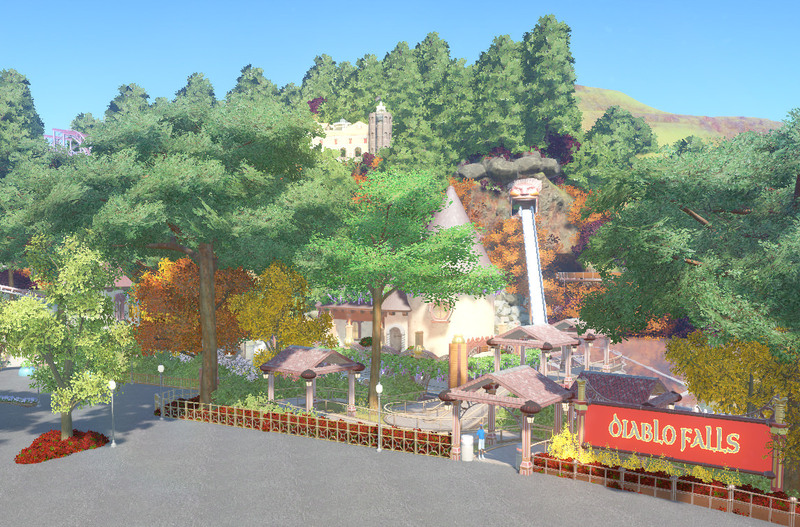 Actually I just changed the name of the ride as I didn't want to over theme it and detract from the consistency I've got going on....so now it's called Palisade Falls. Brilliant success on the integration of the Vintage stuff into your overall theme. 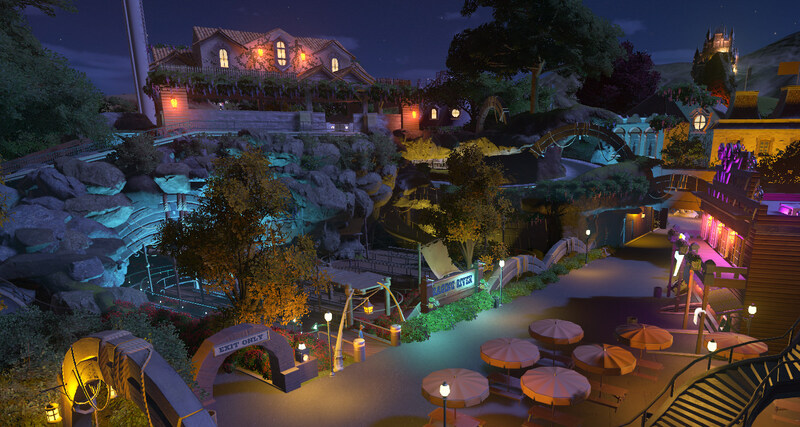 It doesn't stand out at all, it just makes for more of this park's trademark uniqueness. Man, You are incredible at creating these set pieces. 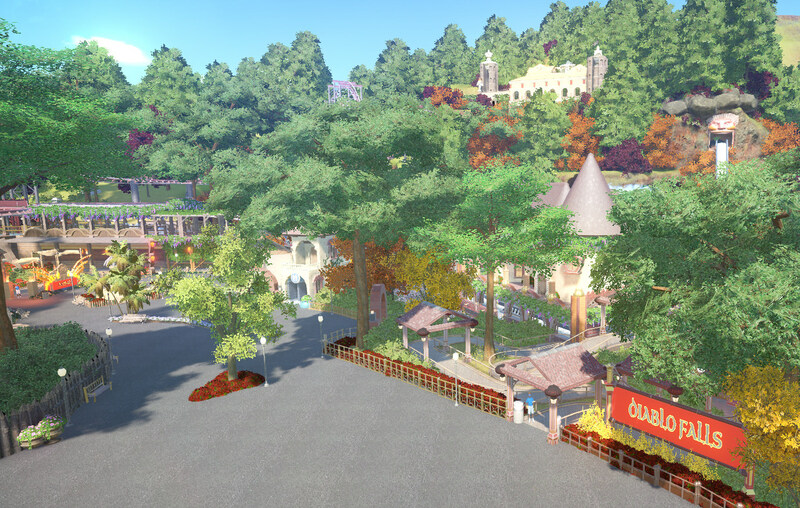 It seems to me there's not a single plaza in the park that doesn't have a brilliant view of a coaster rushing past. That would get me so exited to ride it! 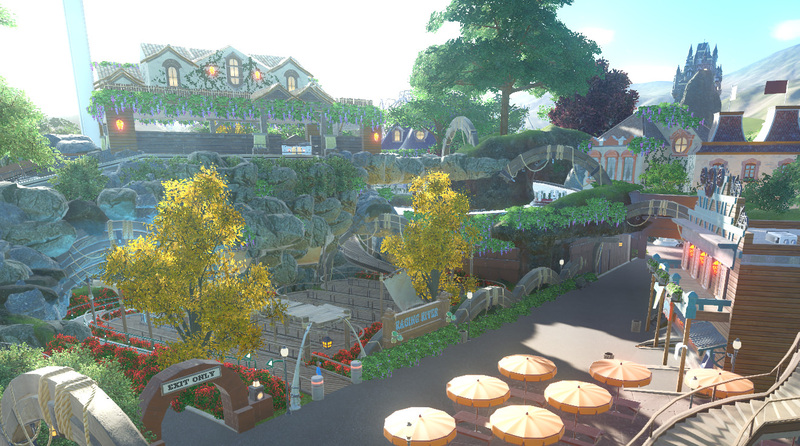 Like Shyguy said, loving how much foliage you're able to fit into every nook & cranny of the park. Im just picking up on this park for the first time. Wonderful scenery, my compliments! Thanks for the kind words. A few shots from today's work, plus an overview so you can see HOW much work there is still left to do.